The 2016 Toyota Prius has been fully designed. This is especially true with the hatchback’s rear which now sports a more swept-back look. The hybrid has been built from the ground up using Toyota’s new global architecture design. This makes it more rigid than the previous models which translates to a well-planted and steady driving experience. The inside of the 2016 Prius is more spacious as well. Designers used premium materials throughout the interior to give it a fresh, contemporary look and feel. The “standard” Prius slots between the smaller Prius c and the larger Prius v. Neither are covered by this review. For 2016, the standard Prius hums out at dealerships in six trim levels. 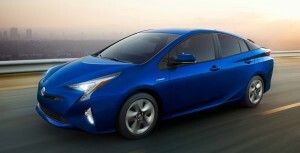 The Prius Two is the entry model into the lineup. Notable features found standard include dual infotainment screens for the driver, a rearview camera system, push-button stop/start, and a tilt-and-telescoping steering wheel and column. Higher trims come with their own set of standard features. Options are few. The Prius Two Eco comes with ultra-low resistance tires while the Prius Three gets Toyota’s high-end Entune infotainment system. Both the Three and the Prius Four can be equipped with the Advanced Technology package. This bundle adds a head’s-up display system, a sunroof, and items from the Toyota Safety Sense package. This last item comes with such advance safety features as automated headlamps and lane-departure warning and assistance. The Prius Four and Four Touring are the top trims of the line. Besides getting all the features from the lower trims, they can be optioned with the Premium Convenience package. A self-parking system and premium audio with 10 speakers are just some of the items included in this sweet suite. Continuing to power the 2016 Toyota Prius is a 1.8-liter four-cylinder gas engine mated to an electric motor and lithium ion battery. The powertrain has a combined output of 121 horsepower and 105 lb.-ft. of torque. Transmission continues to be a CVT.